The Bluetooth Headset is a cellular phone headset that connects to a mobile phone by a radio link instead of a cable. Ericssonth Headset is a wireless cellular phone headset that connects to a mobile phone by a radio link instead of a cable. It is a handsfree accessory that incorporates Bluetooth technology. This product has a built-in Bluetooth radio chip that acts as a connector between the headset and Ericssonth plug on the phone. When the phone rings, one can answer by simply pressing a key on the headset. 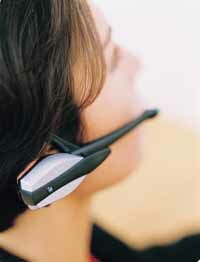 To make a call, one presses the key on the headset and voice recognition initiates the call. The phone can be up to 10 meters (30 ft.) away. The headset weighs 20 grams (0.75 oz. ), sits comfortably on either ear and can be used with Ericsson T28, T28 WORLD and R320 cellular phones. , S-126 25 Stockholm, Sweden. Phone: +46-8-719-0000; Fax: +46-8-184-085.